Amazon is selling Dove Go Fresh Revive Beauty Bar, 100g (Pack of 3) Rs. 129 only best and lowest price online. You can follow the below steps to buy this product at their deal price.Keep Visiting dealsheaven.in for more Best offers ,hot online deals, promo code, coupons and discount . Wondering how to refresh skin and keep it smooth and nourished at the same time? The shower is a great place to kick-start your day with a boost of freshness, but we think that skin cleansing can also be an opportunity to help keep your skin happy and hydrated. That’s why we’ve created dove go fresh, a range of skin cleansing products designed to leave you and your skin feeling refreshed, nourished and hydrated. 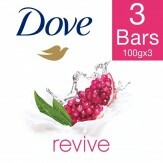 And dove go fresh revive beauty bar does all that with the lively scent of pomegranate and lemon verbena. Dove go fresh revive beauty bar combines our gentle cleansers with ¼ moisturizing cream to deliver skin-natural nutrients while you cleanse and leave you with soft, smooth skin. At the same time, the vibrant scent of pomegranate and lemon verbena gives you and your skin a gentle awakening, leaving you with the feeling that your skin has just had a refreshing drink. Dove is the no. 1 Brand recommended by dermatologists in India. For best results, lather up your dove beauty bar and massage the smooth, creamy lather over your face and body before rinsing thoroughly. For soft, smooth hands, you can also enjoy regular hand-washing throughout the day with your dove bar. Soap may dry out your hands, but the classic moisturizing formula of dove bars will leave skin softer, smoother and more glowing. Buy now. How to buy Dove Go Fresh Revive Beauty Bar, 100g (Pack of 3)?